Most high school athletic programs are shoestring operations. Budgets are negligible. Support staff is mostly nonexistant. 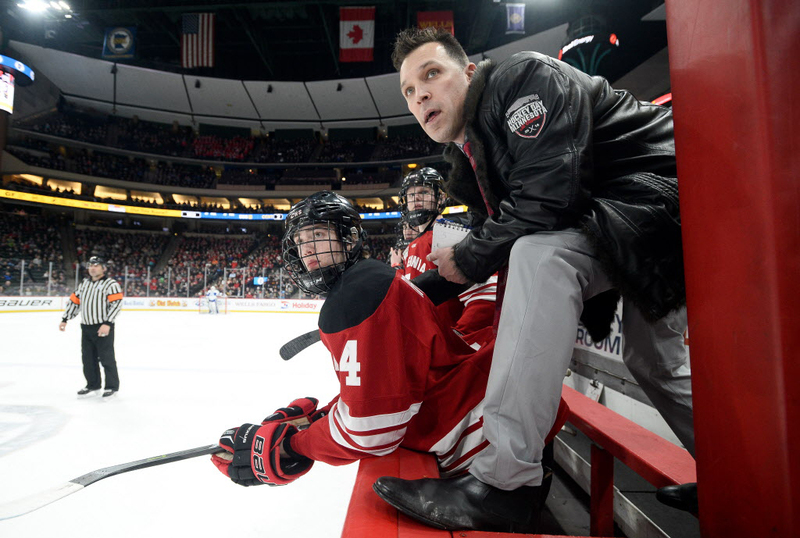 Providing stats, news, notes and juicy insider tidbits for television broadcasters and other media members doesn’t fall into the wheelhouse of most state tournament entrants. A corporate lawyer by day and coach by afternoon and night, Cheesebrough might very well have been a public relations whiz or marketing mogul in a past (or future) life. You don’t just get a sense for what Centennial is all about after reading Cheesebrough’s dissertation on this year’s players and coaches and their myriad activities, you feel like you’ve spent a season or two in the Cougars’ locker room. Coach Menne was the captain (and leading scorer) of the Centennial varsity hockey team in 1989-90. Coach Cheesebrough was the captain (and leading scorer) of the Centennial varsity hockey team in 1991-92. Ritch and Ted grew up on the same street in Lino Lakes (Hokah Drive) and used to play street hockey together while growing up with a dozen other neighborhood kids. The Centennial coaching staff attended USA Hockey’s top coaching clinic in 2014 in Las Vegas. Naturally, Assistant Coach Ted Cheesebrough convinced the other Cougar coaches to go to the Britney Spears concert at Planet Hollywood. When Motley Crue came to the Xcel Energy Center for their farewell tour, all of the Centennial Coaches and their wives attended together as a massive group. The 2016 and 2017 trips were the third and fourth such trips that we’ve organized. We first went to Denver/Boulder in 2014, and then NYC in 2015. The trips were such a smash, that we repeated each of them in ’16 and ’17. In these four out-of-state trips over the past summers, Centennial has gone a combined 15-0. 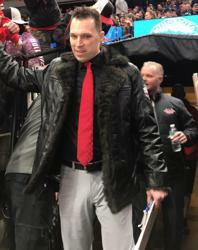 Assistant Coach Ted Cheesebrough has competed in the Red Bull Crashed Ice competition, and still serves as a coach and participant in Red Bull Crashed Ice every year. Now, SIX former Centennial Cougar Hockey players currently race on the Red Bull Crashed Ice circuit! Coach Tolkinen’s son, Zach Tolkinen (also a Centennial hockey alumnus), is in his 4th year playing professional hockey, Zach plays for the Wheeling Nailers in the ECHL (the Pittsburgh Penguins’ East Coast League farm team). Zach played his college hockey at Quinnipiac University and played in the NCAA national title game in 2013. Ritch has even deeper Centennial roots. His grandpa was the school janitor at Centennial High School when it opened in 1958. Ritch’s aunt, Lavonne Menne, was the Homecoming Queen at Centennial in the 1960’s, and Ritch, himself, was the Homecoming King in 1989. As Ritch mentioned, his middle son, Jack, is a senior on this year’s team. Ritch’s oldest son, Richie played for us and graduated in 2015. And Ritch’s youngest son, Sam, is currently in 7th grade and is on the Centennial AA PeeWees. By day, the four Cougar coaches represent a nice cross-section of the working world. Ritch Menne is a salesman, Chris Johnson is an engineer, Gary Tolkinen is a middle school teacher, and Ted Cheesebrough is a lawyer. 1. One video opportunity will present itself for you during our pre-game. After Coach Menne’s final pre-game comments, our team does a roll call for that night’s starting line-up – the entire team responds and it ties into the dog tags that the guys wear which show each player’s name/number on one side and our “If one of us goes to war, we all go to war” mantra. 2. Pictures of those dog tags are attached. The coaches wear the dog tags, too, and the coaches who are Centennial alumni (and all of whom were Centennial “Chiefs”) have their initials and year on theirs. Season 3: “New Year, New Commitment” – we went 3-1-1 against: Brainerd, Maple Grove, Andover, Anoka, and Elk River. The McGregor-Menne-Wagner line is the “Global Warming Line” because they are burning up the Ozone (that is, the Offensive Zone). The Kanner-Brickner-Stuart line are the “Grease Monkeys” because two of the three are in the same Small Engines/Shop class at Centennial High School. The Hermes-Pierson-Nelson line is the “Wild” – because their practice jerseys are Green and Red.